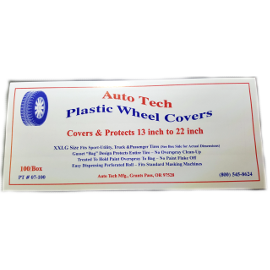 This wheel cover is sized to fit 12-inch to 22-inch wheels - even fits full size sports utility tires - even fits a Toyota Land Cruiser tire! Unlike competitive "shower cap" and hooded maskers that only protect the outside of the tire, our cover protects the tire/wheel on both sides, ensuring that the tires and wheels remain paint free - so there is no over-spray clean up! Our cover is treated for superior paint adhesion, so there is NO Flaking! Painter designed "gusset" feature allows additional use as a buff-out apron to keep painters clothes clean during buff-out! Frankly, painters nationwide say: "If it doesn't say Auto Tech on the cover, I won't use them and I don't want them! ". As a added benefit, greasy spare parts that are typically stored inside on the rear seat or floor can be placed inside our wheel masker and tossed in the rear seat area eliminating the need for added cleanup. Economically priced - easy dispensing from a perforated roll 100 per box.